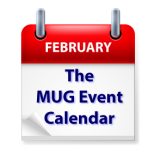 This week’s MUG Event Calendar is busy with lots interesting presentation and events. Jim Rossman of The Dallas Morning Herald will address a Texas group, home automation and The Internet of Things will be examined at a Carolina group, and photography software Aurora HDR will be the main topic at a Colorado group. Other topics for the week include favorite apps, stock Apple apps, medical apps, iPad Pro, tax software, Apple Mail and much more.